To keep your garden in good condition and look after the plants in it, you need to have the necessary skills and knowledge. To have a perfectly maintained garden area with plenty of flower-beds, trees and clean lawn, use our outstanding gardening services. They are implemented by skilled and experienced landscapers and gardeners who know the ins and outs of this work. Our staff can consult you on many questions regarding your plants and open area. 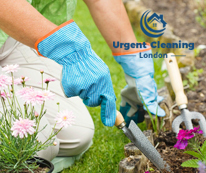 We offer highly professional and inexpensive gardening services in London, suitable for domestic and business estates. Our gardening services are in line with the demands of our customers. We will provide the necessary cares for the plants that you already have and seed new ones if you prefer. Our gardeners have the necessary equipment of machines and tools to do their work. They are qualified, skilful and experienced. If the tree branches in your garden need to be reduced, our staff will trim them. They can shape and cut your bushes and hedges, lay new turf and soil in your garden, mow the lawn. Order the gardening services which you need in your property, situated in London and let us provide them. You will be pleased with the results. You can leave your garden in the hands of our professional landscapers to turn it into a beautiful and attractive area. They work together with the customer to achieve the results that he wants. Use our second to none gardening services, provided in London and in the nearby areas.